It’s now time to become a Virtual Assistant! VAnetworking’s Mission as the market leader for Virtual Assistants is: To maintain a quality community that helps work from home entrepreneurs earn both wealth and respect while maintaining the lifestyle they desire. At VAnetworking, industry experts and Virtual Assistant newbies mix it up to uncover all things new and exciting in the world of Virtual Assistance. We’ve had over 50,000 registered members since 2003. If you’re not hanging out with the thousands of members strong at VAnetworking, isn’t it time to see what the hype is about? 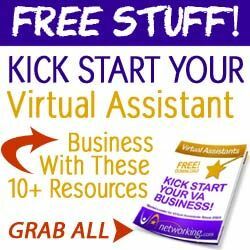 Join thousands of other Virtual Assistants at our FREE, informative, educational, friendly networking FORUM since 2003. With over 30,000+ members and 150,000+ posts, be guaranteed you’ll find all the resources you will ever need to keep your virtual business thriving at its peak performance. We at VAnetworking have discovered a group of you in our midst that is ready to kick things up a notch. You want something a little more “exclusive,” a “total package” designed for the discriminating VA who hasn’t got the time to shop the forums for the best deal. You know what you want and you’re willing to pay for it. Well, no more waiting. It’s here and it’s truly the deal of a lifetime! The VAinsiders Club will truly rock your business with weekly training, a busy job board, group coaching, business templates and contracts, educational resources, advertising perks and much, much more! Whether you are a Virtual Assistant who needs a boost, new clients or a new strategic marketing plan, we have a package suited just for you. Check out the benefits of upgrading your FREE membership to our VAinsiders Club today!